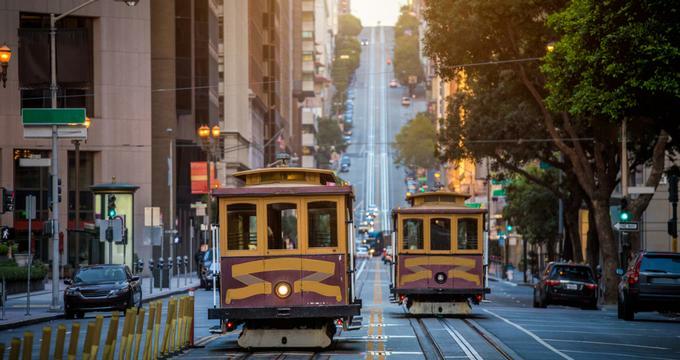 If you’re visiting San Francisco, you’ve probably thought of trying one of their cable cars. It’s a commonly used mode of transportation, but thanks to its old-fashioned appeal, locals and tourists alike like to ride it just for the experience. But the fact that a cable car’s day is often busy means that you might end up getting caught in an annoying situation instead of a fun adventure. This happens when you show up at peak hours where you’ll end up having to stand in line, making you feel like you’ll be spending the rest of your vacation waiting to ride the cable car. You might also end up waiting for a cable car in the middle of its route, which has its own complications. This guide will help you avoid those and other unwanted situations that could ruin your cable car experience. It will teach you the ropes so that you know as much as the locals and can easily avoid the fuss of riding a cable car. Cable cars are often manned by two staff members. The guy who sells tickets is the conductor. He’s also the one that watched over the passengers. Meanwhile, the guy who runs the car is called the grip. He’s the one that connects and disconnects the cable so that the ride will move. In some cases, a car would be staffed with a bell ringer who, as the name suggests, is tasked to ring the bell to signal the car’s approach. It’s a pretty simple yet interesting system. The way cable cars run is they move by getting connected to a moving cable (hence, the apt name for the mode of transportation). Once connected, the car can now move and be controlled by the grip that uses levers and other handles to do so. There’s also a brake to make the car stop. The challenge of running the cable car is not to make the car run and stop, but to do so smoothly. There are three cable car lines that run through San Francisco. You can easily get a map in the city which shows their respective routes. This map will also be useful to ensure that you get to a specific place. Of course, this won’t matter much if you’re just there to enjoy the ride. Powell-Hyde (Green): These lines can be found at Union Square. This one’s pretty easy to remember and figure out because the line run exactly as it says on its name. It starts off from the corner of Powell and Market Streets going to Hyde near Ghirardelli Square. If you want to make the most of this ride, try hopping on it from Union Square all the way to Lombard Street. You can get off from there and walk down the street, heading to the waterfront just a few blocks ahead. Keep in mind that the Powell-Hyde boarding area can get really busy and have long lines. It’s easier to walk a few blocks towards the intersection between Taylor and North Point to take the Powell-Mason line. The Powell-Hyde Line passes by Union Square, the edge of Chinatown, the Cable Car Museum, Lombard Street, Ghirardelli Square, and the Power-Mason line. Powell-Mason (Blue): This also starts at Union Square. Power-Mason Line goes through the edge of Chinatown, the Cable Car Museum, North Beach, Fisherman’s Wharf, and the California Line (Red). This line runs between California at Market and Van Ness. California Line (Red): If your goal is to just take a ride on the cable car, then this is the ideal line to take because it’s got the least traffic among the three. It also makes steep hill climbs, making it a fun ride in itself. When you’re done, you can alight at California and Taylor so you can explore Nob Hill and even make your way to Chinatown or the Union Square. It passes by the Financial District, Chinatown, and Nob Hill. Anyone older than four years old needs to buy a ticket in order to ride the cable car. Each ticket is good for a single ride and getting off means you’ll have to pay again to get back on. Make sure you have small bills with you so paying for the ticket won’t be a hassle. Each ticket currently costs $7 per passenger per way, except for seniors and persons with disabilities riding between 9:00 PM and 7:00 AM, who only need to pay $3. To keep updated with the latest rates, visit the SFMTA website. There are also Visitor Passports that give unlimited cable car rides. This also includes access to the city-run buses and the Market Street F-Line streetcars. The Passport can either be a paper pass or via the MuniMobile app. You can get tickets and other passes from the booths and machines at Powell and Market as well as Hyde at Beach. Getting a San Francisco CityPass (which offers better prices on attractions) also includes a MUNI passport. Consider this option if you want to make the most of your visit in San Francisco. Tip: If you’re traveling as a group, you can save time at long lines by getting one person to purchase tickets while the others get in line. Literally setting foot on the cable car is easy. The tough part is getting a cable car to stop for you as it zooms past the line. The trick is to watch out for the cable car stop signs and wait at the spot after that. While waiting, you’re going to want to check if the cable car you’re boarding is headed for your destination. It’s pretty easy to tell. Stay on the curb and wave at the cable car as it arrives. This is how you tell the grip that you want to ride. Remember to wait until the cable car comes to a complete stop to get on. Also watch out for oncoming cars as you get on the cable car. If you want to get off somewhere, all you have to do is to let the grip or the conductor know. This is unlike other transits where you have some lever or button that you can push to indicate that you want to get off. You’ll have to tell the staff to drop you off at the next stop. Make sure to make the signal a block ahead because cable cars take a while to stop.